A client of Refine MD, an aesthetic medispa in Northeast Wisconsin, shares her experience with our Kybella — a treatment that destroys fat cells under the chin to create a more aesthetically-pleasing facial profile. 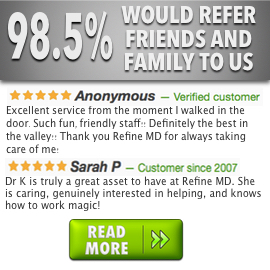 To find out more about the products and services we provide through our talented staff of aestheticians and doctors, please visit us online at RefineMD.com or at our Menasha, Wisconsin office, where we serve the entire Fox Valley area.A client of Refine MD, an aesthetic medispa in Northeast Wisconsin, shares her experience with our Kybella — a treatment that destroys fat cells under the chin to create a more aesthetically-pleasing facial profile. To find out more about the products and services we provide through our talented staff of aestheticians and doctors, please visit us online at RefineMD.com or at our Menasha, Wisconsin office, where we serve the entire Fox Valley area.